Our home is filled with many tacky, brass builder lighting fixtures. Slowly, I am replacing them as I find yard sale treasures, but I am going to bite the bullet and buy a few new fixtures as well. 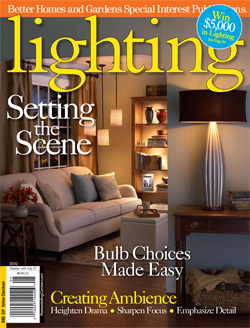 I was thrilled to see this deal for a Free Better Homes and Gardens Lighting Magazine from American Lighting Association. I just grabbed mine, and looking forward to some design inspiration. Hurry and get yours as well.